An exciting day as October draws to a close. 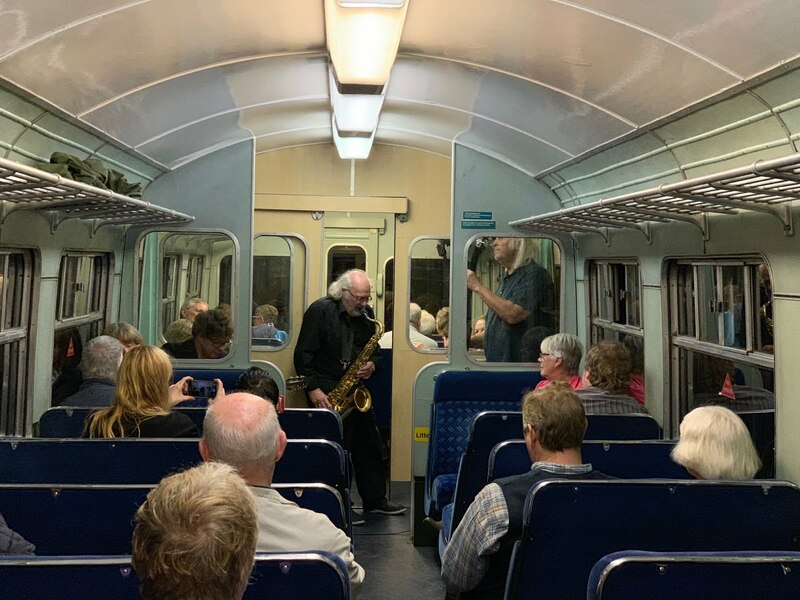 We performed a test run ahead of our Shottle Specials which start this weekend and operate every weekend in November. They are formed of steam locomotive Henry Ellison on one end and a diesel locomotive (either Class 14 or 08) on the other with three Mark 1s sandwiched in the middle. Today's test run brought about another first for our railway as it was the first steam heated train to operate on our line! Of course, the first steam heat passenger train will be Saturday morning. This morning a water tanker was tripped to Shottle as a backup water supply for the month should it be needed. A testing customer did some work on the incline and the PW team worked on drainage around The Hannages area too. That's it now! The clocks have changed and we're heading into the winter! 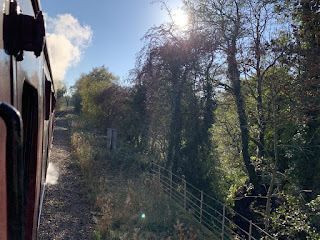 Today was the last regular Sunday service of the season to Duffield, with services in November running between Wirksworth and Shottle only using a top and tail steam/diesel combination. It wasn't too bad today with the chilly but sunny weather bringing in a steady number. In addition, a walk of the town organised by the newly reopened Wirksworth Heritage Centre added some interest. The Station Café had a reasonable day with a small group coming in for afternoon tea. Down the yard, the Maintenance Facility was shunted to allow repairs to take place to the corridor end on Class 108 53599 and also to change the vehicle on the pit for maintenance. Work continued on TSO 4440 too. A cold, artic chill blew along the valley today together with a few snowflakes. Not surprisingly it was a quiet day passenger wise. As there was no report from yesterday I should mention that over 250 people attended Markeaton Crematorium, Derby to bid farewell to our friend and colleague Graham Walker. Befittingly an EVR Guard of Honour assembled at the entrance to the crematorium to meet the funeral cortege. Down the yard a suitably excited Tim Oakes took a delivery of various railway related materials from Tunsted Quarry. No doubt Tim will provide more details in due course. The LMSCA and DMU Restoration Team were duly engaged in their respective projects with the final preparations being put into place for the November Steam to Shottle specials. Today's service was supported by the Booking Hall staff, EVRA shop and Station Cafe. Finally, I have attached my favourite photograph of Graham who even managed to raise a chuckle from HRH. A fairly steady back-end Thursday today on the trains, with Iris handling the services. Down the yard, much fettling of the Mark 1 stock took place as final preparations on the steam heating systems took place ahead of next week. 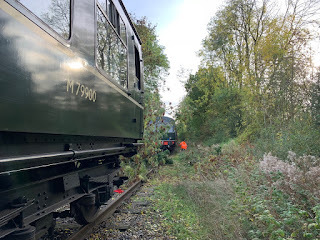 A small team set about the DMU and shunting fleet with a hydrometer to measure coolant temperature strength in anticipation of colder weather arriving soon. DMU 51505 has had a lot of work done to it and exam work continue on that car ahead of it returning to traffic soon after a long period of absence. The toilet compartment has been rebuilt, the roof sealed, a door repaired and various other interior jobs, alongside exam work and adjustment of the suspension. The team were hard at work this morning continuing with wooden framework for the new station building. Firstly apologies for not writing anything last night but I was exhausted when I got home! Not to worry though, it was a great day. Wirksworth's first ever Wizarding Day and wow was it busy! I don't think anybody expected the idea to be as successful as it was with literally thousands of people visiting the town to take part in all of the activities around, including potion making, broomstick making, Quidditch etc. 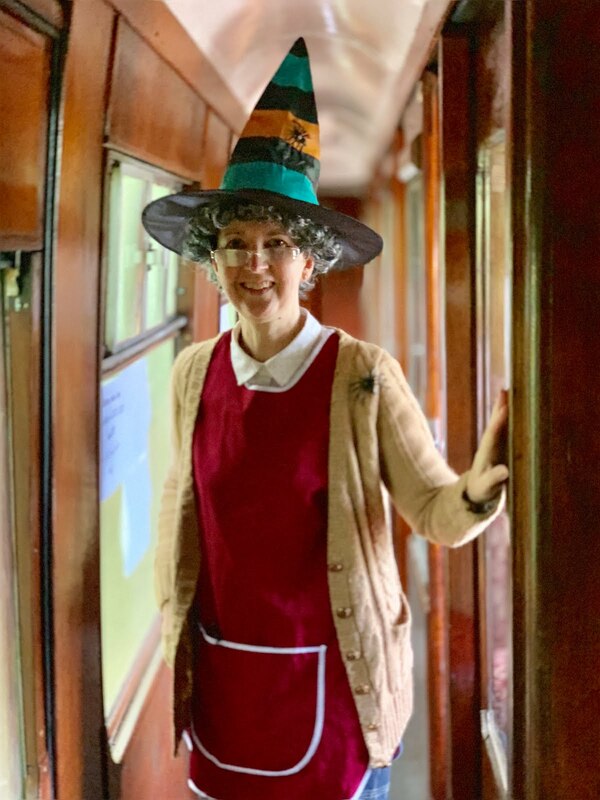 We hosted our own Wizarding Specials with the first train an earlier than normal departure off Duffield with around 130 people all dressed up in various wizard and witch costumes. The following departure from Duffield was equally as well loaded and it just went like that really for the rest of the day. Everybody was very complementary of the experience, especially the authentic trolley selling sweets. The normal Blue Timetable had been converted into loco-hauled with the Class 73 doing the honours with 5 Mark 1 coaches. The Catering Dept has an extremely bumper day with extended hours and queues all day. The afternoon saw the EVRA AGM at the Red Lion. I think it came to the surprise of some people that they struggled to even get to the railway with the traffic in the town and even when they did, the car park was rammed full. A reasonably quiet day on the railway. The Maintenance Team worked away on preparing 55006 for returning to service, working on an injector pump today. The Class 33 was tripped to Shottle to fetch a flat wagon to load up some S&T equipment for use down the line. Some members of the team attended John Blackmore's funeral service in the town. There is a nice tribute to Graham Walker in Heritage Railway Magazine which is dropping through doors this week. A calmer day in comparison to the day previous with fewer obstacles to encounter, although we were blessed with heavy rain for most of the day! Nevertheless the lure of the Wirksworth Model Rail Exhibition enticed the punters some of whom travelled on the train and enjoyed the warmth and delights of the Station Cafe. Owing to the weather all tasks down the yard were being undertaken in the cover of the maintenance facility with Team TSO sanding the East bodyside and applying a protective undercoat and John applying further coats of paint to the underframe and fuel tank of Faraday. A relatively steady day given the conditions and I would like to thank everyone for their efforts, particularly Pete Watts who turned in to cover the Third Man turn at very short notice! A strange sort of day for the first day of the Model Railway Exhibition Weekend which is back in the calendar again after a year off last year. It was very mild, shirt sleeve temperature, but very windy as well. I'm not sure how busy the exhibition was but judging by our car park it must have been reasonable. All was going well for most of the day, with the Station Café being busy and the incline hosting two one hour driving tasters. 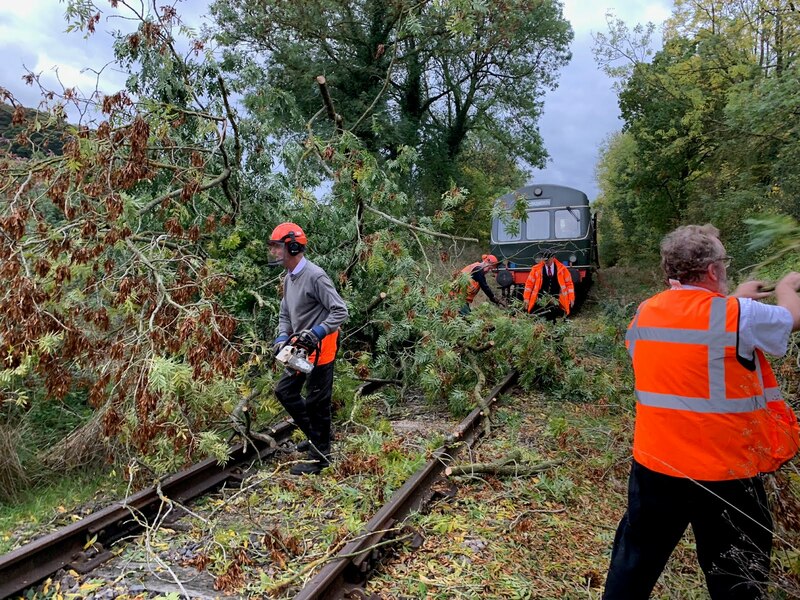 However, the 15:05 ex-DD ran in to trouble when it discovered a large tree blocking the line near 49 Steps. It hadn't been there on the up journey and now the train was stuck on the south side of the blockage. It was time to bring our training in to action! 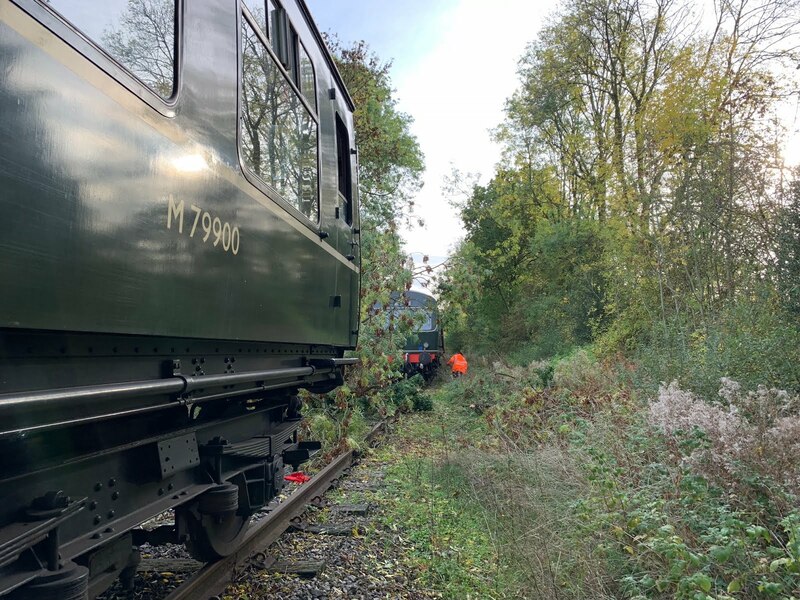 Quick organisation and some phone calls meant we were able to scramble another DMU from Wirksworth and move the passengers from one side of the blockage to the other to get them back. Fortunately, Mick and Mick were available at short notice to come in from home with their chainsaws to remove the tree. It was one of the largest I have seen over the line! Thankfully all this was cleared up in time for a very successful Jazz and Chips evening special with around 125 passengers enjoying the trip. Fairly quiet around the railway today with most of the activity coming from the PWay team. They are digging the drains and ditches out in the 49 Steps area to help dry the track formation out before they tackle the sleepers. The Maintenance Team were working on the exam part of 55006 as it hopefully nears service once again. We were greeted this morning with some mindless vandalism on platform 3 with broken glass scattered over the platform together with discarded alcohol cans and there was also evidence of an unsuccessful attempt to gain access to 50170. 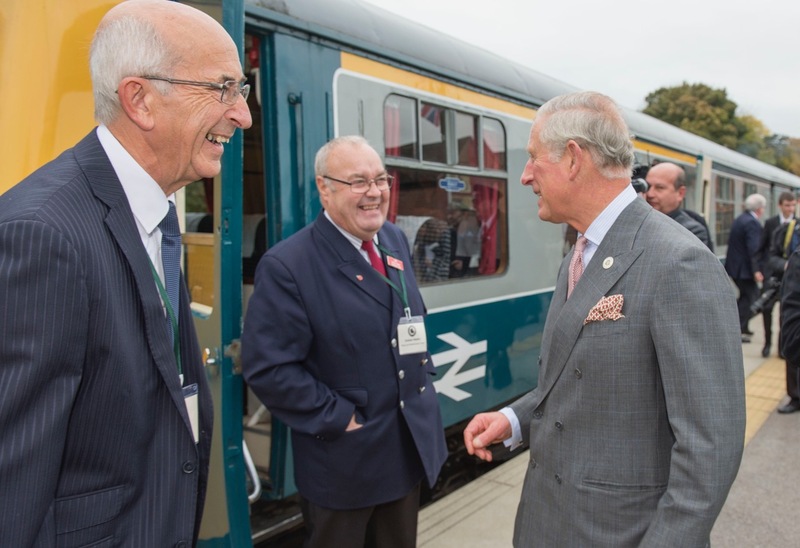 Todays early morning weather was cold and miserable which did have an impact upon visitor numbers for the first Duffield service but as the weather improved we enjoyed much better passenger numbers. Down the yard the LMSCA gathered for their Annual General Meeting and work continued on the Duke of which Tim will enlighten us in a separate update. Todays service was supported by the EVRA shop, Booking office staff and Wirksworth Station Cafe and a mention must go to the train crew who coped admirably with wet leaves and slippy rails. Quieter now the mid week service has slowed but it does enable other works to take place. For example, yesterday saw the mini digger levelling and grading the ground for the Wirksworth Miniature Railway extension which will be excellent when it is completed. Work continued on changing an unloader valve on DMU 50253 which completes this vehicle's exam. Work also continued on the Derby Lightweight DMU and TSO 4440 around the shed. Class 101 E51505 is also in the works with attention the toilet compartment having a makeover.